DURING THE PAST few days, trad internet forums have been abuzz over two shots that “Pope Francis” (Bergoglio) has taken against trads. The second shot came in the form of a Vatican decree for the Franciscan Friars of the Immaculate, an officially-approved group that has been taking advantage of Benedict XVI’s 2007 Motu Proprio permitting wide use of a form of the traditional Latin Mass. Priests in the group celebrated both the Novus Ordo and the pre-Vatican II Mass, but the overwhelming majority used the latter. The Vatican decreed that henceforth the Novus Ordo must be used and that special permission would be required for using the old Missal. The decree stated explicitly that its provisions had been personally approved by “the Holy Father Francis” himself. But these interventions, dramatic though they be, have drawn the attention of traditionalists away from other, equally horrifying things that Bergoglio has been up to at the same time. This is an open license for allowing these nutty crypto-protestant groups not only to expand and continue to function, but also to do so without hierarchical supervision. Hey, it’s the Holy Spirit. 3. Dumping the “Pope” Title. 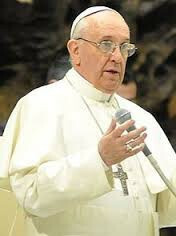 Already Bergoglio has dumped the title “pope” when signing documents (including his first encyclical), banished traditional papal titles from the main page in the Vatican yearbook (Annuario Pontificio), and repeatedly referred to himself in public as “Bishop of Rome. 4. Trashing Papal Authority through “Synodality.” I predict that this is really the area to watch. Bergoglio has already hinted that he has an agenda for the institution of the papacy and church governance that is no less than revolutionary. His CELAM speech laid out the principles for an ecclesiastical restructuring (at least in South America) along the lines of the ’60s liberation theology/base communities initiative. It was loaded with leftist bromides about good pastors “following their flocks” which are led by the Holy Spirit, dialoguing, etc., etc. From these two comments, it seems that Francis intends to institute a radical overhaul of ecclesiastical institutions and the whole decision-making process in the Church. The “synodality” language should be particularly scary. I think it portends “synods” of bishops (if not clergy and laity) on the international and national level that will be given real legislative authority. Francis has already praised the Orthodox schismatics for this set-up, and has alluded to the importance of “synodality” several times as a way of implementing Vatican II’s teaching on collegiality. Then the fun for the modernists will really begin. (Democratic synods are the voice of the Holy Spirit! We are Church. The voice of the People of God must be heard!) They couldn’t pull this off in the ’60s and ’70s, but it looks like Bergoglio will give them another bite of the apple. Bergoglio’s disdain for the old Mass will look like nothing more that a sideshow, once he gets going on all this. This was written by Rev. Anthony Cekada. Posted on Wednesday, October 23, 2013, at 4:48 pm. Filed under Francis / Bergoglio. Tagged Francis / Bergoglio. Bookmark the permalink. Follow comments here with the RSS feed. Comments are closed, but you can leave a trackback.